Mom Blogger, Photographer + Writer, Activist + Advocate Has Arrived! 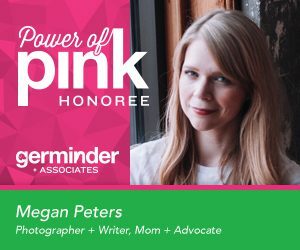 “I am so honored and humbled to be named as a Power of Pink Honoree. I began my professional career at Germinder + Associates, and what I learned there has been extremely valuable as I’ve moved through my life’s work. I am so grateful to be a part of the Germinder family! Thank you to Lea-Ann and the Germinder team for this recognition,” said Megan Peters, Founder of August Light Studio. “It’s a distinct honor to be included in the company of my peers for this award. 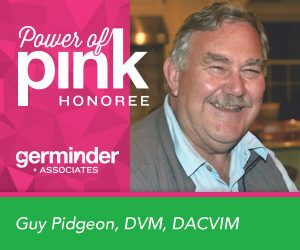 Giving back is important for every profession and I appreciate what Lea-Ann is doing with this program to benefit the veterinary profession, my colleagues and those organizations we hold dear,” said Guy Pidgeon, DVM, DACVIM.